LAHORE: (Thursday, October 11, 2018): The officials at Punjab Governor’s House have invited Punjab University Institute of Agricultural Sciences (IAGS) in tree plantation ceremony on 'Plant for Pakistan and Olive Adaptability Block’ at Governor’s House. 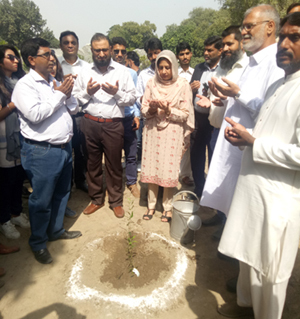 The students and faculty members participated under the supervision of IAGS Director Prof. Dr. Muhammad Saleem Haider. During this ceremony, Begum Perveen Sarwar, wife of the Governor Punjab, inaugurated the campaign as chief guest. During discussion with the chief guest, Prof. Dr. Muhammad Saleem Haider briefed about the academic and research activities of the IAGS. He also told that majority of the students at IAGS are female and highlighted the role of female students in agriculture. The chief guest appreciated the role of females in agriculture and advised the female students to participate in all the fields. 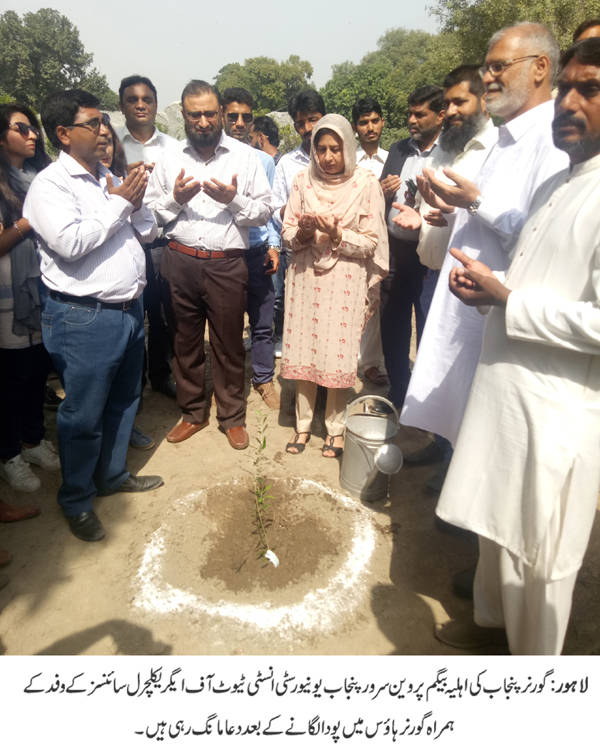 During discussion the Chief Guest invited Institute of Agricultural Sciences to start kitchen gardening and other horticultural projects at Governor’s House.